Example of a Dark Tower. Dark Towers are massive structures found in the center of Dark Forest biomes. 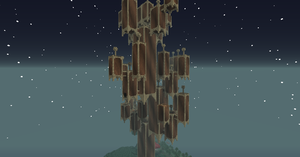 They're home to an array of unique mobs, including Carminite Ghastlings, Carminite Ghastguards, Carminite Broodlings, and Carminite Golems; these towers also harbor the mighty Ur-Ghast boss. Dark Towers are made mostly of Towerwood Planks and Encased Towerwood, but they also harbor many Dark Tower devices, such as Reappearing Blocks, Vanishing Blocks, and Anti-Builders, to name a few. These towers also hold some valuable treasures, including Steeleaf, Ironwood Ingots, Charms of Keeping, and Charms of Life. The various devices that comprise the traps and puzzles in the tower can be harvested straight from the tower or crafted with Carminite (the two exceptions being the Anti-builder and the Locked Vanishing Block). The tower is also the only place to find Experiment 115. Dark Towers can be extremely dangerous and complex structures to navigate, as they are laden with traps and hostile mobs. Aside from flight, The main way to scale the tower is to climb the main sections of the tower and unlock the doors of Locked Vanishing Blocks- there are usually three of these locked doors. The four Tower Keys that open each of these doors are hidden around the smaller segments branching off the main tower- Finding all four keys to a door will often require some careful exploration. Along the way, Carminite Builder puzzles, Reappearing and Anti-Building mazes, Parkour challenges, and other nefarious traps await. The obvious danger of falling off becomes more prevalent on the upper levels, as the tower is in an increasing state of disrepair the higher one climbs. Once an explorer reaches the top, it is time to fight the Ur-Ghast. This page was last modified on 2 August 2017, at 08:50.